Kaitlyn Miller admits that when she was first moved to goalkeeper on her[more] 10-year-old soccer team, she wasn’t wild about the idea. And she got really good at it. So good, in fact, that today she signed a letter of intent to continue minding the goal (along with her education) under scholarship at Harding University. A three-year starter for the Bryant Lady Hornets, Miller likes being a keeper just fine now. “I like how, if the team is in trouble and I’m that last person on the field and if it’s just one good save to win the game, I like being that person,” she related. 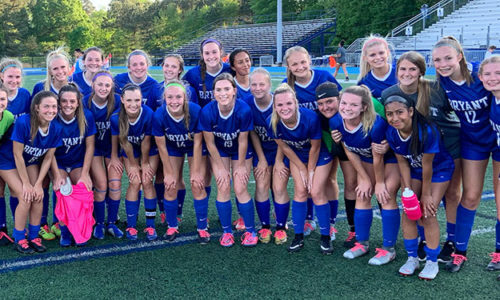 “If you would’ve asked me her sophomore year if I ever thought she could go play college soccer, my answer would not have been what she’s doing today,” allowed Lady Hornets coach Julie Long. “She has come a long way. She’s worked really, really hard. She’s put in the time. Every summer since I’ve been here, she’s put in the time going to keeper training. The daughter of Lee and Annette Miller, Kaitlyn said she and her parents were filling out applications to a variety of schools in the state and she was leaning toward attending Arkansas State University in Jonesboro. When the applications began to be accepted, Harding was one of them. Miller and the defenders in front of her have been a big reason the team has gone 44-20 over the last three seasons including this year's 10-2 start. They're 4-0 in the 7A/6A-Central Conference tied for the league lead with Conway. The team is in search of its fifth straight trip to the State tournament. After reaching the semifinals in 2010 and the quarterfinals in 2011, they've got designs on a big finish. 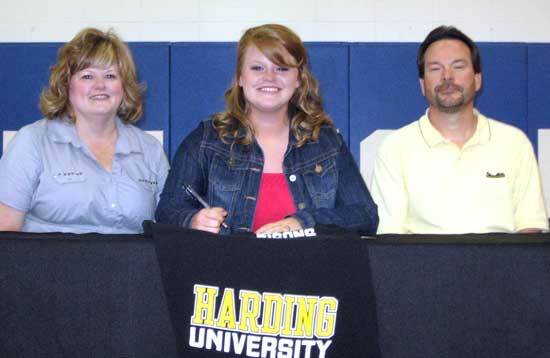 A visit to the Searcy school sealed the deal on college for Miller. It also helped that Harding has a good Biology department, Miller said. That’s what she wants to study. Long indicated that Miller may get some playing time as a freshman. “She’s kind of the total package,” Long said. “She’s really focused on fixing her high balls. That’s always been her biggest weakness and she’s save a lot of them this spring already. She’s really worked at it. It’s not been easy for her but she’s been determined and she’s got it done. What’s funny is she probably has the best footwork of anybody on my team and she plays in goal.